High Springs, FL--The Fellow Travelers put together one of those infamous spur of the moment day trips for June 21, 2008 and attracted a dozen souls to make the trip. The destination was the Santa Fe River. The Santa Fe is a very pretty river and the section from the US 27 bridge west of High Springs to the FL 47 bridge south of Fort White passes some of the prettier springs to be found in Florida. Put-in was to be at 8:30. Since Art Shelfer was in Missouri no one was late. Rookies Ronnie and Kim Marchant rode down from Moultrie with Charlie and Diane Stines in the Exhibition. Diane also brought her dog, Ami. Roy and Eric Moye were already at the put-in when the Moultrie crew arrived with the canoes, and Sam Brown was early for his rookie voyage. 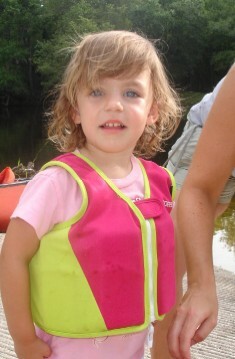 Mile and Haley Spiers brought their two year old daughter, Miley, along for her first canoe trip. Donna and Jerry Ellis arrived at 8:29. Donna wore her stunningly beautiful Fellow Traveler shirt. Once the canoes and kayaks were unloaded the cars were shuttled to the take-out. The dozen paddlers were headed downstream by 9:15 AM. The sky was overcast and threatening rain but that meant that the temperature was very pleasant for the first day of summer. Everyone seemed comfortable. Roy and Eric wanted to paddle one of the King’s fleet so they took the Penobscot 17 (Gunn boat). Roy found it to be a little flexible but managed it well. The Spiers familly rode the Penobscot 16, Charlie, Diane, and Ami paddled the Canadienne, Ronnie and Kim took Ronnie’s Grumman aluminum, Sam Brown was afforded the privilege of using the Wenonah Prism solo, and the Ellises had their colorful solo kayaks. The rookies did well. Sam will be welcome on any trip becau se he is an accomplished storyteller (liar) and because he can handle things should Shelfer ever make good on his promise to commit regicide. Ronnie will be welcome back for many reasons--he is somewhat of an authority on birds, he is learning to cook in Dutch ovens, he has his own canoe, he is a banker, and he might again bring his charming wife, Kim. Miley was not counted as a rookie because she had at least been along for the meal portion of a trip. The Santa Fe is generally a clear, shallow waterway. Lots of fish were visible and many of them were jumping mullets. Turtles sunned on rocks and logs and other turtles could be seen swimming in the clear water. The bird life was incredible. Before the trip ended the boaters had seen great blue herons, little blue herons, egrets, ibises, a wood stork, an osprey, an owl, some vultures eating possum for lunch, limpkins, hawks, an owl, a pileated woodpecker, kingfishers, scores of songbirds, and several yellow crowned night herons. The float down the river is very scenic despite the number of vacation homes and mobile homes along the banks. Cypresses, pines, cedars, and hardwoods line the banks. Some of the banks are low and swampy and others are higher. 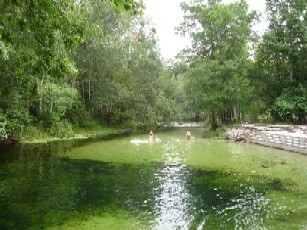 The Santa Fe does not have the grotto-like l imestone banks common on the upper Suwannee. Much of the land along the river is posted. It took about an hour to reach the park at Poe Spring. The swimmers were making the most of the cool waters but none of the gang went for a swim. Miley did wade some. By the time the group left the threat of rain was becoming greater and the thunder and lightning seemed to be getting closer and closer. The next side trip was at Lily Spring. This is a beautiful small spring and is home to the fabled Ed, sometimes self-billed as Naked Ed. The spring run is an absolutely gorgeous little water trail to the spring and to the palmetto hut occupied by Ed. Ed was sitting on a little platform above the water but the railing did not allow one to see if he wore his loincloth or if Ed wore nothing. Unlike on a previous occasion Ed was solemnly quiet as if meditating but only raised his hand and said he was great. He did not seem to desire conversation. He merely raised his hand and acknowledged the intruders. By the time the paddlers reached the river the gentle feel of raindrops began cooling the dozen paddlers. It got wetter. There were lots of paddlers on the river. Some of the crew got to witness a a kayak flip when the lady inside handed the end of her paddle to another kayaker and he pulled on it. The assist was enough to allow the lady to practice her Eskimo roll but she just stood up in the chest-deep water beside the overturned craft. It was not long until the flotilla arrived at Rum Island County Park. There was a crowd present. A hard rain was falling by that time. Although the park did have porta-johns it had no shelter. Nevertheless, the group decided this was the place to eat lunch and wait for the lightning to subside before paddling farther downstream. Everyone ate lunch. Several of the park visitors kept giving the group curious glances but someone finally decided the reason was Sam’s yellow coroner’s jacket. But apparently no one was dead--in Sam’s phraseology everyone was on the right side of the dirt. Once the storm was over the paddle to the end began. 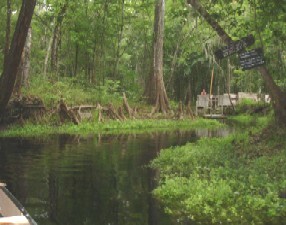 The rains ceased before the boats reached the Ginnie Springs park area. That area was very crowded. Although there were a lot of people on the Santa Fe there were still a lot of birds and turtles to be seen.